DTCP recruitment 2017. Online applications are invited through the official website of DTCP @ www.dtcp.ap.gov.in from 04-May-2017 to 18-May-2017 for one year contract period of Diploma apprentices under 1961 Apprenticeship Act. Candidates who are interested in working with DTCP as Apprentice then can submit their application before the closing date. Candidates may select their respective zone for attending the Apprenticeship. 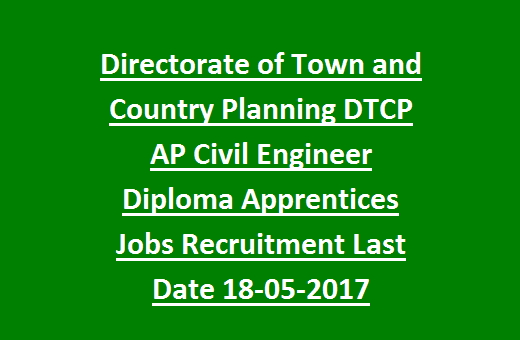 Those who are qualified Diploma in Civil Engineering they are eligible to apply for DTCP Diploma Apprentice. 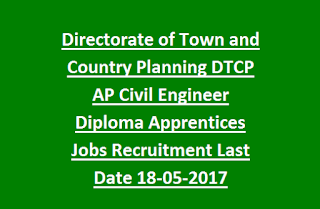 Full details of Diploma Apprentice DTCP Directorate of Town and Country Planning are given below. There is total 252 posts available in Directorate of Town & Country Planning of Andhra Pradesh State. As on 01-04-2017 Candidates must have crossed 18 years for applying this DTCP Diploma Apprentice Jobs of AP Government. Monthly Rs.9460/- stipend will be given for selected candidates. Candidate must have qualified SSC and Diploma in Civil Engineering or having license of Architecture Assistantship which is approved by AP Technical Education and Training Board. Selection will be based on purely merit in educational qualifications for this DTCP Diploma Apprentice vacancies. Eligible candidates may login to the official website of AP Directorate of Town & Country Planning @www.dtcp.ap.gov.in and fill all the details. Online application link will be closed on 18-05-2017.